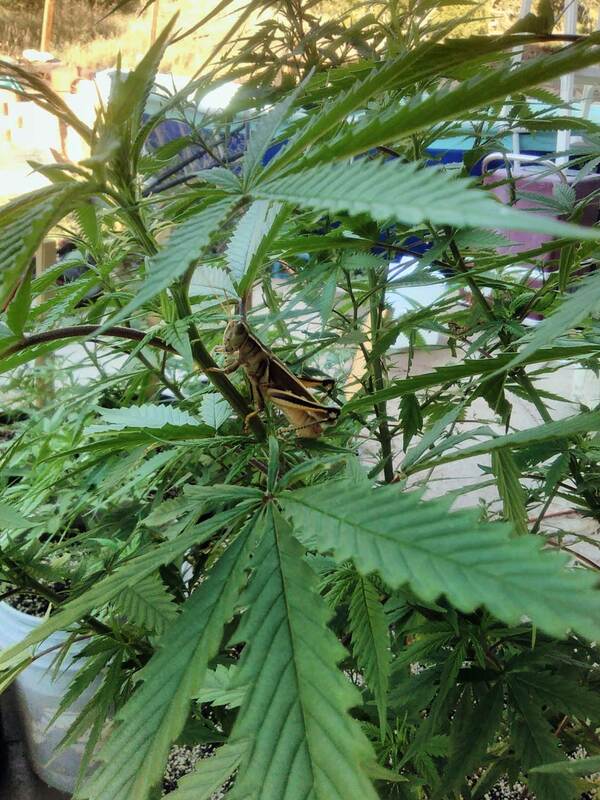 Grasshoppers (and sometimes locusts, which are basically just grasshoppers with wings) will hapily eat your cannabis leaves and live among the branches >.< If you see this pest, it’s a good idea to get rid of them before they build up in numbers! 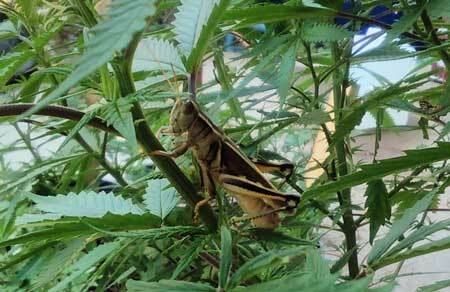 Grasshoppers will eat holes out of your cannabis leaves, and you don’t want that! If it’s just one or two grasshoppers you may not notice any symptoms but if your plants start getting infested with them you’ll noticed tons of spots where they have been munching on your leaves. If an infestation gets out of hand your plants can be seriously affected. The best way to prevent a grasshopper infestation (or any bug infestation really) is to catch them as soon as possible! Spinosad Products (safe & organic) – Spinosad products are organic and completely harmless to pets, children, and plants. Spinosad products can be used directly to kill grasshoppers on contact and should be sprayed liberally all over the plant. Although maybe not as strong against pests as some of the more harsh insecticides, it does work and it’s very safe for plants, animals and humans! Spinosad is an organic insecticide made from the fermentation of a specific soil bacteria (actinomycete Saccharopolyspora spinosa) and kills grasshoppers via ingestion or contact by effecting the insect’s nervous system. Spinosad can be a good choice for organic and outdoor growers, because it is very toxic to grasshoppers , but is less toxic to many beneficial insects, bug predators and spiders. Fatty acid salts or insecticidal soaps can be a good choice against grasshoppers. They weaken the outer shell of grasshoppers but are safe to use on your plants and they don’t leave much of a residue which could kill beneficial bugs in your garden. Neem Oil will leave an unpleasant taste/smell on buds when used to treat flowering plants, so again, don’t let this stuff get near your buds! There’s also some evidence Neem oil may be harmful to humans so use with care! That being said, Neem oil is an all-natural remedy that is very effective against many different types of bugs and mold, including grasshoppers. You will need a mister (also called a “One-Hand Pressure Sprayer”) to spray all the leaves evenly, since neem oil and water can separate easily. These may not be the best choice for all cannabis growers, but these are very cheap and effective against grasshoppers because it physically prevents them from getting to your plants, while still letting light in to your plants. You can also water your plants through the netting. These are sometimes used to make mini “green houses” on the plants, or some grower will just drap them over the plant as they’re so light and airy they don’t really bother the plant. However, these are much easier to use and are more effective with smaller plants, as it becomes difficult to fully cover larger plants. However, for young plants these can be great! They also protect your plant from wind and some harsh conditions. Pyrethrin based insecticides are not very toxic for humans and degrade quickly, which is why they’re commonly recommended for vegetable gardens. You will need a mister (also called a “One-Hand Pressure Sprayer”) to spray all the leaves evenly. Pyrethrin products break down quickly, over the course of just a day or two. The major problem with them is they are very toxic to bees. Although cannabis plants generally don’t attract a lot of bees, please use this as a last resort, and also try to use it right after the sun goes down because bees sleep at night. This lets it start to break down before they wake up. Use pyrethrin products when the sun goes down! Save the bees! A popular example is Bonide 857 Pyrethrin Spray Concentrate. Use 3 tablespoons of concentrate per gallon of water. Marijuana Nutrients – What do I need to know?